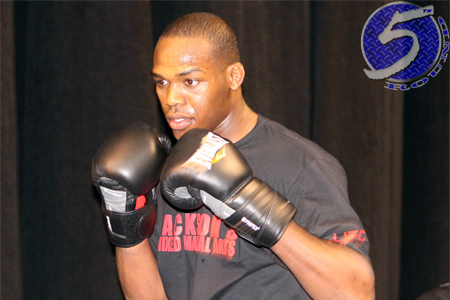 Once again, UFC kings Jon Jones (Pictured) and Anderson Silva will look to get mixed martial arts off the ESPY snide. Jones and Silva have just received nominations in the “Best Fighter” category. Both superstars have been up for the award in the past – Silva in 2009 and Jones in 2011. This year’s other nominees include WBC welterweight champ Floyd Mayweather, Jr. and current WBA and WBC middleweight champion Andre Ward. Mayweather captured the trophy in 2007, 2008 and 2010. Jones’ 2011 campaign was arguably the most masterful the sport has ever witnessed. After handing Ryan Bader his first professional blemish in February, “Bones” went on to become the youngest champ in UFC history by taking Mauricio “Shogun” Rua’s title just one month later. The now-24-year-old then throttled former champions Quinton “Rampage” Jackson, Lyoto Machida and Rashad Evans. Silva, on the other hand, competed just twice last year. He unleashed the front kick heard ’round the world on Vitor Belfort at UFC 126 and followed up with another highlight reel finish against Yushin Okami at UFC 134. Randy Couture, Rampage, Machida and Georges St-Pierre (three times) are other MMA fighters who have received nominations in the past. Could this finally be the year a mixed martial artist takes the trophy? It’s up to the fans, so vote HERE and make sure our voices are heard.